Stars wheel above Calhoun County Park, where tales the Cale Betts ghost are told around campfires. Photo: Jesse Thornton. 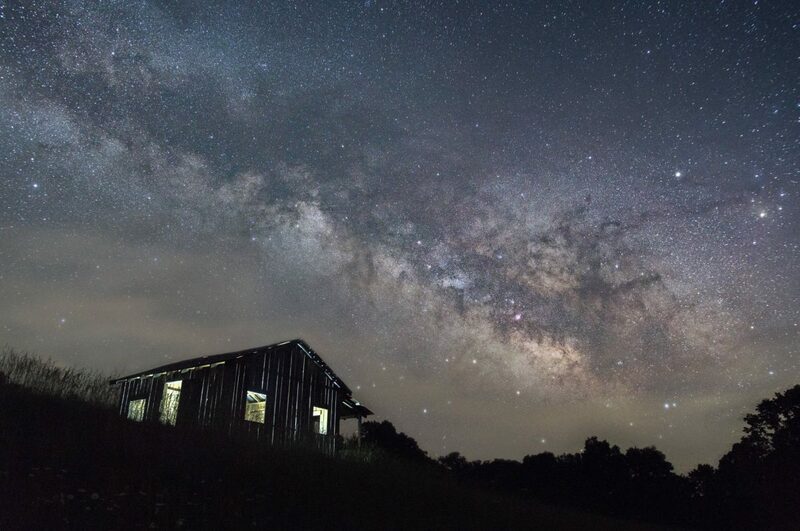 Far from city lights, nights in Calhoun County are counted among the darkest in West Virginia — so it’s little wonder that the tale of one of the state’s strangest hauntings comes out of its hills. That which supposedly manifested in the valley of the Little Kanawha River in the late 1800s is still a subject of discussion — both around the campfire (the county is a favorite destination for campers and hunters) and in the classroom, where teachers use the tale as an example of local lore and history. “Sure, we still talk about the ghost,” says Linda Jarvis, a retired school-teacher and a member of the town council in Grantville, the county seat. The cause of the alleged haunting, usually a central feature of most ghost stories, remains obscure. It’s also remarkable that the location of the haunting changed after the destruction of the house in which the ghost first appeared. “The ghost of Betts’ farm will not lay. Something over a year ago, the Enquirer contained an account of an occult influence or manifestation at the farmhouse of Mr. Collins Betts, about three miles below this town, in which story were delineated a number of weird, strange instances of ghostly manifestations, all of which were verified by the testimony of honest, brave, and reliable citizens, the names of many of whom were mentioned. “Since then the old house has been torn down, the family of Mr. Betts rebuilding a homeplace on a different portion of the farm. This act, it was believed, would lay or forever quiet the ramblings and queer doings of the inexplicable mystery. But such has not been the case. Since the building has been razed, the mysterious manifestation has made itself visible at places sometimes quite a distance from the scene of its former domicile. “At a distance of several hundred yards from the old Betts place, a neighboring farmer had erected a house in which he intended to reside and, in fact, did reside a short time, but the Cale Betts Ghost, as the manifestation is commonly called for a distance of many miles, was no respecter of persons and oblivious of distance, and it so annoyed and frightened the farmer and his family at untoward times that he removed his house to the opposite end of the farm, leaving is yard, orchard, and all the improvements usually made about a farmhouse to themselves. “This in itself was considered strange enough, but the ghostly visitant did not stop there. The high road, running some distance away, has been the theater of almost numberless scenes of frights and frightful appearances. “Among those who have lately seen the ghost is a young man named Vandevener, whose father had once been frightened nearly to death, as related in a former letter. Young Vandevener had frequently made sport of the old man’s fright, but he does so no more. In fact, the young man is willing to make affidavit that the old man’s story was mildly drawn. “The young man was driving along quietly one night about half a mile from the Betts place, when he saw a strange being, which in the pale light of the moon he took to be a man walking at the head of his horses. A few minutes later the man, or whatever it was, glided without making a particle of noise around the horses’ heads and got into the wagon and took a seat by his side. “Young Vandevener says it rode along with him several hundred yards and spoke to him. It first told him not to be afraid, as it did not intend to injure him in the least. What it said, he will not tell, except that it admonished him not to say anything about it until a certain time. After it had spoken to him, Vandevener says, it got up and glided off into the woods and disappeared. “He says the shape was that of a headless man and that while it was with him he felt a cold chill run over him, although it was a warm evening, and this chilly feeling did not leave him until the disappearance of the shape. Since then, Vandevener cannot be induced to go over the ground after night. “Henry Stephens, on his way past the same place, saw a peculiar shape rise out of the brush by the side of the road and glide along by the side of the wagon. Stephens got out of his wagon and gathered a handful of rocks, which he threw at the object. Some of the stones appeared to go through it but did not seem to affect it in the least. It still continued to float along at a short distance away until Stephens became frightened and whipped up his horses until they flew at a two-minute gait down the road, the object following at some distance until quite away from the scene of its first appearance, when it disappeared like a cloud of vapor. “There are dozens of authentic stories of the ghostly peculiarities of the Betts ghost which are new and peculiar. It appears since the destruction of the Betts homestead to have taken up its quarters near the highway, and here it appears to people who have generally scoffed and laughed at the former stories. “That it is bullet-proof does not need testimony, located, as it is, in a section of the country which has for years been noted for its fearless men — such as the Duskeys, Downs, and others of national fame as sharpshooters, scouts, etc., during the late war. “None of these men have succeeded in ‘laying’ or putting a quietus to it. There is a story that a couple of men had been murdered or disappeared in this vicinity and that the ghost is the uneasy spirit of one of these men, but there is no real evidence that anybody was ever killed there. “There is no doubt that Calhoun County has a mystery which neither time, bullets, courage, nor philosophy can either drive away or explain. It has come to stay. Next articleAirBnB to support furloughed federal employees in W.Va.